CPD Director Dr. Marcelina Carpizo, addressing the participants. High school students of the Zamboanga State College of Marine Sciences and Technology and college students from the Western Mindanao State University are committed to continue to pursue peace works. This was learned from Dr. Marcelina Carpizo, Director, WMSU Center for Peace and Development. The students formulated plans for the promotion of peace in their school and in their communities. These are an offshoot of classroom peace video conferences which the high school and college students participated in with their respective Manila student counterparts. The series of conferences which started in November, last year, was made possible through the facilities of Peace Tech. An NGO, Pace Tech seeks to build bridges of understanding, reduce ignorance, and ultimately lessen conflict through video conferencing among people of various cultures and coming from different places. The ZSCMST students’ teleconference with their counterpart from the Esteban Abada High School in Manila was held on January 11 at the WMSU-CPD conference room. Conference facilitators in Zamboanga City were Mr. Joey Castillo and Mr. Lloyd Lowell G. Branggan, both teachers of ZSCMST. Observing the exchange at the Manila hub were Mr. Robin Pettyfer, Peace Tech Founder and President; Mr. Jan Vincent Ong, Peace Tech Executive Assistant; Mr. David Delano D’Angelo, Peace Tech Communication Officer; and a representative of the British Embassy. On January 28, a total of 90 WMSU college students met, through videoconferencing, with their counterpart from the Far Eastern University Morayta hub, in three batches. The WMSU students were from the College of Criminal Justice Education and the College of Asian and Islamic Studies. 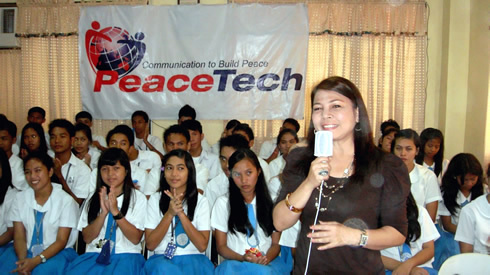 Facilitating the conference in Manila was Ms. Helen Colon, Peace Tech Coordinator. Students eagerly and freely voiced their sentiments and thoughts on, as well as shared their experiences of prejudice and discrimination. It may be recalled that on December 1 last year, more than 2,000 youths gathered at the Dr. Juanito Bruno gymnasium of WMSU for a similar activity. It was part of the annual Mindanao Week of Peace celebration. The Zamboanga hub was hosted by Ms. Baicon Macaraya and the Manila hub by actress-TV host KC Concepcion.